4:30 p.m. EDT: Sometimes the entire energy industry sinks, and when it does, companies that are levered to oil prices like Seadrill are going to go down with the ship. What's happening: Shares of Seadrill (NYSE:SDRL) took a 10% nosedive today, adding even more to pain to shareholders as the stock is now down almost 79% since this time last year. It appears that today's sell-off is mostly related to the entire energy sector taking a fall after Brent crude, the international benchmark price for oil, slipped below $50 for the first time since January. Why it's happening: We all want clear logical explanations as to why things happen, but sometimes that just isn't in the cards. Today is an example of hard-to-explain market logic. You can point to a plethora of reasons that oil prices are slipping again -- fears that OPEC could continue to produce oil, Iran production lifting following the nuclear deal, slowing economic growth -- but when it comes to oil prices, there is no true panacea. However, investors seem to treat $49.99 per barrel of oil much differently than they treat $50.01 per barrel, and Seadrill has fallen victim to a massive sell-off across the entire energy sector as that less-than-$50-per-barrel price point has been breached. 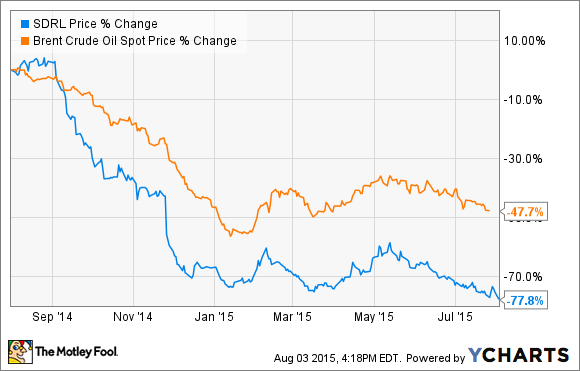 Seadrill doesn't actually sell oil or gas, so its revenue isn't directly related to prices. Instead, investors are betting that lower oil prices will lead to less and less demand for Seadrill's new rigs, which will either result in some of its rigs going without contract or lower contracts. So as long as oil prices remain low and oil producers put off spending plans for another day, Seadrill's shares will suffer because of it.